Champ Software is pleased to announce that Karen Monsen, PhD, RN, FAAN, was chosen as a presenter during one of the afternoon sessions for the Michigan Premier Public Health Conference (MPPHC) on Mackinac Island, October 3-5, 2017. Her topic will be, Social Behavioral Determinants of Health & the Omaha System: Empowering Local Health Departments to Address Health Inequality. Dr. Monsen is an Associate Professor for the University of Minnesota School of Nursing as well as the Co-Director for the Center for Nursing Informatics. Dr. Monsen has also served for a number of years as the Director for the Omaha System Partnership. In this capacity, she leads frequent focus group discussions on Social Behavioral Determinants of Health (SBDH). In April, 2016, Dr. Monsen presented at an Expert Webinar hosted by Champ Software. Her topic was Social Determinants of Health and the Omaha System: Showing our Work and Outcomes. It was an excellent presentation, centering on a study done by the University of Minnesota. In 2014, the Population Health Informatics students at the University of Minnesota began a study at the request of the MNDOH to find out how SBDH are documented. 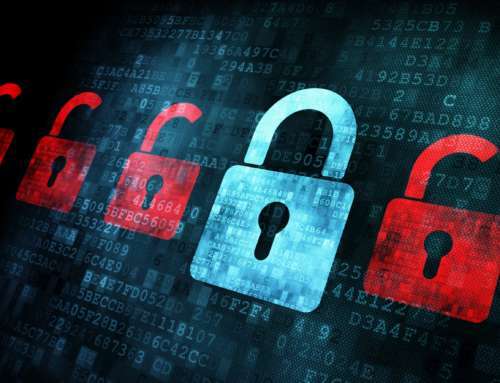 The purpose of the study was to examine the documentation of SBDH in electronic health records (EHRs) with and without standardized terminologies. The second phase of the study was to look at how SBDH could be mapped to the Omaha System standardized terminology or were found in the Omaha System. 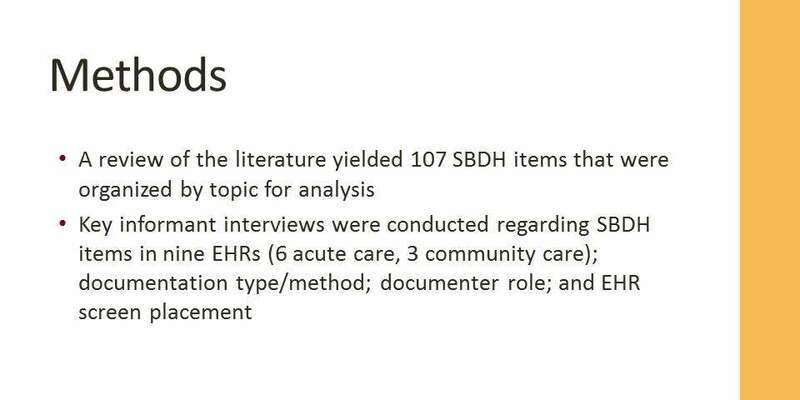 Dr. Karen Monsen stated, “We did key informant interviews of a convenient sample of nine EHRs, looking at the documentation of 107 SBDH items in EHRs, including documentation type and method, documenter role, and EHR screen placement. “We found that a number of documentation methods were used and the items were documented in diverse screens by multiple staff roles. “We also discovered one of three standardized terminologies was used to document SBDH in the nine EHRs: ICD-9/10, SNOMED CT, and the Omaha System. 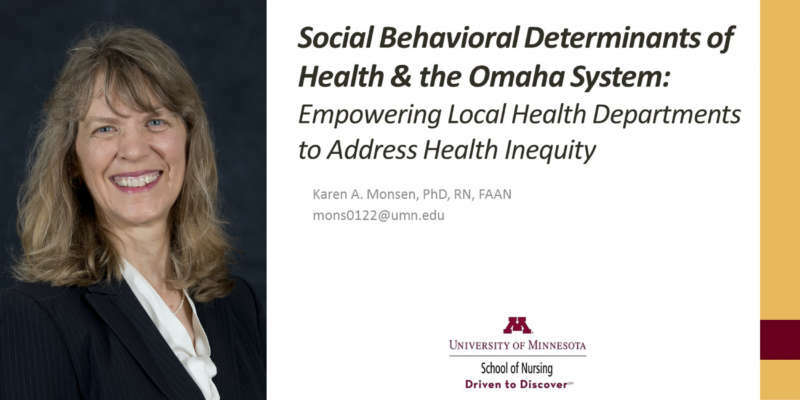 During her upcoming presentation at the MPPHC, Dr. Monsen will be describing SBDH and how they affect health equity in a community. In addition, she plans to help attendees identify how community health agencies can use the Omaha System to document SBDH in the community and provide evidence-based outcomes. Giving attendees a better understanding of how SBDH affects their community’s health equity as well as providing them with the tools they need to document their work to improve SBDH and health equity, empowers local public health agencies to show their work and outcomes. The ability to prove the care they are providing to their community and demonstrate the outcomes of that care has tangible, practical, and immediate benefits. A local public health agency can change their practice where the practice is not having the intended affect. They can demonstrate their work to the board or prove the effectiveness of a program when applying for funding. Better, more effective practice and providing funding to programs that are working in turn directly benefits the community, putting resources where they are needed most and where they are making the biggest difference. Dr. Karen Monsen is an excellent speaker whose wealth of knowledge, depth of experience, and passion for community health inspire listeners to act on the words she speaks. We are so excited to hear Dr. Monsen’s upcoming presentation and share notes with all of you afterwards. If you plan to attend the MPPHC in Mackinac Island, MI this fall, please don’t miss this excellent presentation! For more information on the upcoming conference, click here. To access a recording of Dr. Monsen’s presentation at the Michigan Premier Public Health Conference, click here. Her presentation was excellent and powerful, a very encouraging look at what public health departments can do with data! If you’d like to know more about how Champ Software’s Nightingale Notes EHR (one of the EHRs that was used to provide the data Dr. Monsen references in her presentation), contact us! Crystal Maertens is the Marketing Specialist at Champ Software, Inc. Hailing from states across the Midwest, Crystal settled in Minnesota in 2005 and has been working with Champ Software since 2011. She loves working for a company with as much heart as Champ Software and enjoys making a difference in the lives of public health workers. An avid reader and writer, Crystal has written many blog articles for Champ Software and especially loves writing articles that feature Champ clients.